Introduction: Gastric Imbrication and Sleeve Gastrectomy are both procedures which utilize bougies to size the new stomachs. However, bougies don’t allow the surgeon to tell if the stomach is too tight or too big. Bougies also does not give realtime feedback to the surgeon so even if the surgeon discovers the problem during the surgery addition measures are needed. The endoflip device allows the surgeon to size the new stomach in realtime and prevent the creation of stomachs that are too large or too small. 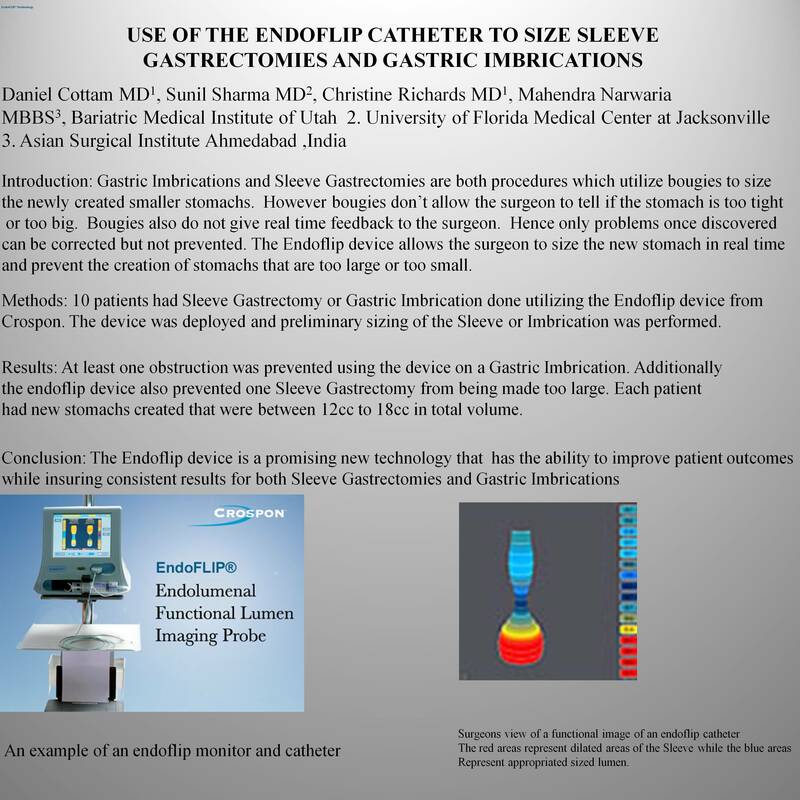 Methods: 10 patients had sleeve gastrectomy done utilizing the Endoflip device from Crospon. The device was deployed and primliminary sizing of the Sleeve and Imbrication. Results: At least one obstruction was prevented using the device on a gastric imbrication. Additionally the endoflip device also prevented one Sleeve gastrectomy from being made too large. Each patient had new stomachs created that were between 12 to 18cc in volume. Conclusion: The Endoflip device has the ability to improve patient outcomes while insuring consistent results for both Sleeve Gastrectomies and Gastric Imbrications.